F1 2018 - What are the two new vintage racers added to line up? Two stunning classic F1 cars that will feature in the new game. F1 2018 will release onto PlayStation 4, the Xbox One family of devices including the Xbox One X and Windows PC (DVD and via Steam) worldwide on Friday 24th August 2018. Brawn completed an incredible double World Championship in its only season as a team, securing both the 2009 drivers’ and constructors’ titles. The car won eight races that season including six wins for Jenson Button in the first seven races of the year. Button went on to win the Drivers’ World Championship ahead of Sebastian Vettel. “The inclusion of classic cars in last year’s game was a huge hit with our players and fans of the sport so we wanted to build on that with the inclusion of more classics in F1 2018,” commented Paul Jeal, Franchise Director for Formula 1 at Codemasters. “The Brawn is without doubt the most requested classic car by our passionate F1 community, so we are delighted to be bringing it to the game. 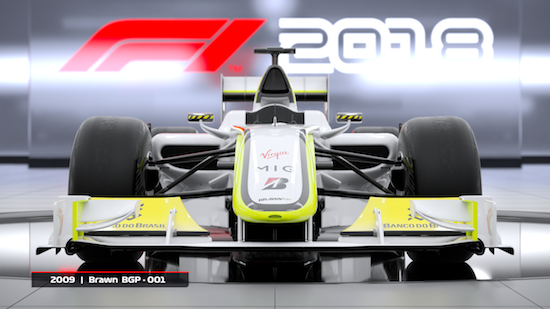 Consumers who pre-order or purchase ‘Day One’ copies of F1 2018 will have exclusive access to the iconic 2009 Brawn BGP-001 and the 2003 Williams FW25, as DLC content of the ‘F1 2018 Headline Edition.’ Alternatively, the two cars will be available to be purchased together at a later date. 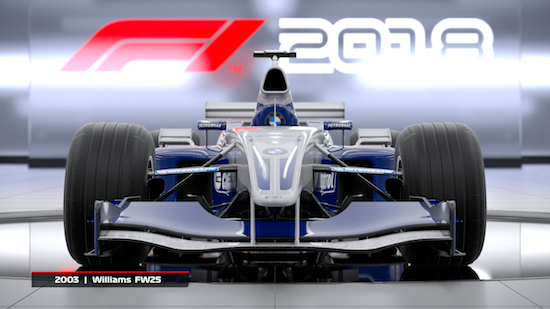 More news F1 2018 news will follow soon, including the reveal of the additional classic cars, which have been selected from community feedback.